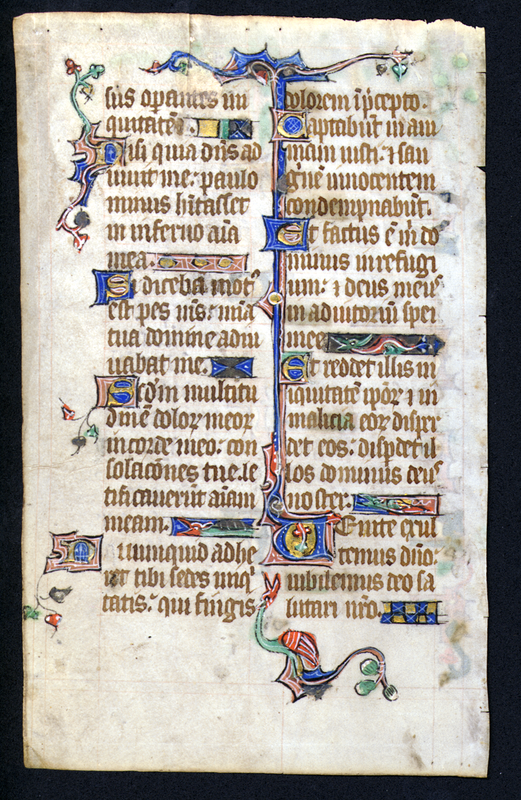 Psalter (Psalterium). England; Late 13th Century. Latin Text; Angular Gothic Script. Size: 17 x 11 cm. Observations: The vellum of this leaf was once nearly white, but now appears dirty. The ink for the bulk of the text is brown, with blue, orange (or weak red), green, and white in the decorations. The silver has tarnished. There are dragons, foliage, flowers, and pointed ivy as marginal decorations. Illuminated initials begin each verse, and bars are placed at the end of lines to complete them when the text is too short to fill them; these lines include both geometric designs and additional dragons.